How about use a Raspberry Pi as a controller to try to make the best use of the energy during the day? But I get the impression that it would make more financial sense to invest that $5k in the stock market. Stock market is not guaranteed, it can easily go down. It is in fact a gamble, a solar system is the opposite of that. Also, $5K in the stock market isn't much in terms or return if you are talking dividends and spreading your risk. A solar system will last 20+ years (ok, maybe not the inverter), so if you pay it off in say 5 years, that leaves 15-20 years of returns. If you think energy prices will ever go down by any significant amount, you are kidding yourself. If I used all the energy I produced I'd save approx $1300 per year (based on 15kWh/day) after the payback period. That is about 25% per year return on that $5k investment, practically guaranteed. That beats the share market any day. Heat pumps, heat/cool your house a few degrees beyond your target when power is cheap, the insulation will keep it comfortable. Freezer, ideally with a fan forced fridge to use the stored energy as the food in the fridge won't tolerate temperature cycling like the frozen food will. Smart meter uptake was supposed to drive the availability of "smart" appliances that would have these sorts of features built in, but the in home displays are hard enough to purchase/install let alone something complex like a controlled load. Has it decreased the value of your home? My guess, no. It has increased its value, it's a visible feature. Here in Seattle I often average $0.05/kWh USD. Combined with the very general lack of sunlight here, its a horrible economic proposition. Not true. You just need a bigger array. Because solar panels have gotten so cheap, you can get twice the array at 1/4 of what it would have cost just 5 years ago. And WA has an incentive program that pays you beyond what you save on the price of power from your utility. If any of your equipment ismade in WA you get paid even more. Because my inverter is WA made, i get paid $0.18 per kWh in addition to the $0.07/kWh I save. If your panels and inverter are WA made then you get $0.54/kWh! Unfotunately there is only 1 company making panels in WA and they are expensive. We don't have a dedicated freezer. Already said we do this, washer and dishwasher. It already has a timer, or we simply turn on manually. Basically, there is nothing we can "automate" that would save anything. Correct, it adds value, likely much more than the cost, gotta love psychology. It won't be long before houses without solar will be frowned upon a little by buyers, if it's not happening already. Yeah. But so is a pool a feature but it doesn't appeal to all buyers. I suspect very few people would look negatively upon a solar system. Hence it may not add value if the buyer would pay to fill it in. Who would get rid of a functioning solar power system? A solar system is unlikely to factor greatly either way given it's relatively small value. House prices are governed by more immutable things like position, land size, schools, transport and so on. Of course, but it's all part of the psychology. I've been to auctions were people are swayed to bid first because they can win a free bottle of plonk. Or get excited at an open home because it has a kind of tap they like. Or walk out of a rental apartment investment because it has some gyprock cracks etc. Humans are generally not that rational and calculating, they are emotional creatures. Yeah. But so is a pool a feature but it doesn't appeal to all buyers. Hence it may not add value if the buyer would pay to fill it in. A solar system is unlikely to factor greatly either way given it's relatively small value. House prices are governed by more immutable things like position, land size, schools, transport and so on. The economics make my head hurt but I think early adopters are as likely to be motivated by environmental concerns as they are by the economics of a solar system. They would also have gotten stung by the reduction in the feed-in tariff ( at least in Victoria) so whether it was better to invest the money in the stock market or paying down the mortgage is not clear cut. In Canada the money is better spent on insulation. In fact insulation is a big selling feature. True location and all the others are bigger but anything that reduces monthly expenses and does not hurt your (or your neighbors) property value is good. If it also helps with the environment and you are in favor of that then why not. Even purely cosmetic things offer little to the value of the home but I keep my grass cut and have nice landscaping. I like the way it looks, I enjoy my home. Here is article on the age website (newspaper) about a family in Melbourne who installed a 3.6kw solar power system and a 16kw battery system that can be used when energy from the grid is at its most expensive. Couple of interesting points. First of all, my 2kWp system (brand new, Netherlands) at €1300 investment pays back for itself in like... 4 years? We have one-to-one payback. With second hand (unused but older) German panels you can get down to 2.5y payback period. That is batshit crazy; it means that even when lightning strikes and completely destroys your uninsured PV system after 10 years, you'd still have had a couple hundred percent ROI. With the average system lifetime being about 19 years around here (and rising, because newer systems are generally much more reliable than the early-2000s systems), there is zero financial reason not to install solar panels. Better still, the government has promised not to decrease FIT in the next 3 years. You'd either have to have objections against the aesthetics or an extremely unfavourable roof orientation/shadow casting to not install solar panels here. Of course, things are quite different abroad. I'm amazed at your 7.5y payback period even at relatively high installation cost and low FIT. This probably has to do with considerably more sunshine (2500ish in Sydney vs 1600 for the Netherlands). Battery systems have fallen out of favor really rapidly because of the freefall pricing situation that solar modules are in. A sufficiently large battery, even the cheapest flooded cell lead acid batteries (~$0.10-0.12/Wh), will cost about the same as the solar installation, have quite a low efficiency (80% typical cycle efficiency at very low charge/discharge rates, worse with a smaller battery) and basically at this point will never pay back for itself. Even with these big differences between FIT and consumption cost. It seems fine at first glance, but a lot of people don't grasp the engineering behind battery systems. For instance, you can't efficiently charge lead acid batteries at high rates; they only achieve reasonable efficiency at C/30 to C/100. So you should install a battery that is 30 to 100 times as large as your actual energy need. At 20kWh/day (for a 3-3.5kWp system in AUS), that's a 600 kWh battery or about $60 000 - without chargers, without inverters. And even then you will still lose a couple tens of percents in efficiency losses. Lithium ion chemistries fare a lot better and can be scaled to C/2(ish), but they are about 5-10x as expensive per kWh and have slightly less charging cycles (about 2500-5000 at such conditions vs 10 000 for PbZn). Either way, lots more expensive than the actual solar installation, so your payback time on something like that will be tens of years or a century or something. There are ways to optimize a battery system, undersize it and all that jazz but it'll never be cost effective unless energy prices are really high. Which looks like a storage system, so it could have an element added to it to dump some power into. Though probably not worth the effort compared to waiting until it needs replacement and going for a solar unit at that time. Air conditioning systems in Australia are predominantly air source heat pumps. Depending on the specific gas tarrifs and COP of the heat pump it may or may not be cheaper to heat with it on mains compared to a gas heater, but your excess electricity going cheap would be cheaper by a good margin. Many all in one fridge/freezer combinations are already using this technique of pumping the freezer air through to the fridge section to maintain its temperature. Reworking the control system with different setpoints for the freezer depending on the availability of excess solar power could reduce the running cost of a typical fridge/freezer by more than half which will more than pay off the cost of the conversion over the life of the fridge if you do it your self. This is the sort of feature which would cost almost nothing to integrate with the fridge when its designed but there is "no market" for, just like very energy efficient chest fridges. There is but its a lot of work, changes in behaviour would probably be able to save more power. Yeah, I have to say Dave that I would expect you of all people to have some battery storage hooked up. It seems ridiculous that your electrons are worth so much less than the grids electrons. I've had solar panels fitted to my house here in the UK in October '13. It's a small terraced house so the panels almost cover half the roof. I'm fortunate that the roof faces due south. As I'm 68 it was not viable to pay for a system so I went for the free option! The smart meter shown sends them a reading so they can claim it. Its complex in Australia as you generally cannot have batteries that are interconnected with the grid, they need to be a changeover system which adds some significant complexity. You can cheaply log generation and usage for Mains AC on a diy scale using a combination of a "current cost" style energy meter, a Raspberry Pi and some open source software called "measureit"
A pool has running and maintenance costs and does not match everyones lifestyle ambitions. So it may be a feature but people value the benefits of something and not the feature itself. Probably no-one would get rid of (or even switch off) a working solar system. Both a pool and a solar system are features, but a solar system would be a benefit to nearly everyone, but a pool not necessarily. Exactly. In many cases a pool can actually be deal breaker, either way actually. Some people it's a must-have for the kids, others don't want it for fear of drowning kids and/or maintenance or space etc. Yes, we have storage for our 1080 watts (four Mono-X panels) in our truck camper. We use two Lifeline 12V 125 AH AGM connected in series (24V system). Really too small a battery for the amount of solar, but over-paneling means we get some charging current even in cloudy conditions. As far as battery efficiency, the Lifeline AGM can be bulk charged at insane rates...100 amps would not be too much for our small bank even though 45 amps is about the max we could get on 24V with only 1080 watts. They require about 105% to 110% of the current drained from them to recharge them, the rest is lost in heat. Lifetime at 50% DoD is around 1000+ cycles. After bulk charging gets you to 85%, the remaining absorption charge takes 2 to 4 hours to get you to 95% to 100%. It might not make sense to have storage for a permanent house, but a off grid truck camper parked in some remote area storage makes a hell of a lot of sense. We may use the "waste not" feature of the Midnite solar MPPT controller to dump excess power into our 6 gal water heater when the batteries are topped off. Nice analysis, even if I could put panels on my house, which I can't because of multiple reasons, it would appears it would be a losing proposition for me. We pay $0.062 kWh 7AM - Midnight and $0.0498 kWh from Midnight to 7AM because of a special rate I get from my electric cooperative because I have an Electric Vehicle they give me a discount on the entire house year round! Just based on my usage and the winter rates that is about a 25% decrease in my bill, will be 30% or more for summer rates in the SouthEast US! Can one choose not to export the excess energy to those greedy bastards ? I don't know how your inverter works but here in the UK our EVER Solar TL-4000GB doesn't export through the whole cycle so even when we're generating more than we're using we're still reliant on the grid for power at the start of the cycle which we're billed for . 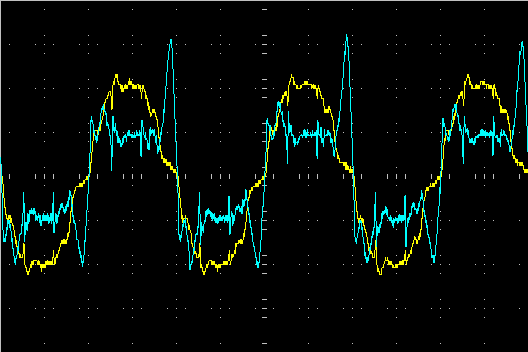 The solar is connected to the fuse box and you can see it's still importing during the first part of the cycle and then starts to export for the rest of the cycle (other than the big peak at the end where we're not generating enough which I'd assume is caused by those pesky SMPS) I'm wondering if the initial "listening" phase might be related to the island protection? No need to worry about net metering, expensive grid tie, or storage batteries (which average 12 cents a KWH, more than your electric). If you stay under 400W, 100% of potential solar power is actually used. A 36V panel string at power point is enough voltage to use standard heating elements. 2000W 120V elements available at any big box building supply work even better. A cheap micro with some junk box parts and you have a system. Anyone can find a place for three panels around the house. No need to sense current. 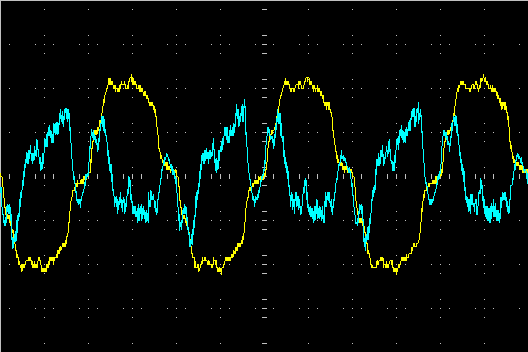 with a fixed resistance PWM gives enough info to calculate power point. This will be the future of solar just like adding extra insulation to the attic became common. Several utilities investigated heat pump water heaters as a way to reduce peak loading in the morning and evening, search HOTSHOT documents. Just think of the energy reduction if everyone used this solar augmentation. nice video on the solar system. I'm working here in Germany at a heat pump manufacturer with SMA on automizing heat pumps with the SMA Sunny Home Manager. In your case a hot water heat pump would be a good idea. They use a 500W cold engine and have a 300 Liter storage tank. With one kWh, 8 cents in your case, they produce 4 kWh thermal energy. So in your case ist is 2 cent/kWh for the thermal energy which should be much less than gas. Also CO2 savings are huge. Your SMA inverter can be equiped with a simple relais solution to start the heat pump when the PV system reaches a certain threshold.